The Long Stay car park is by far the best known spotting location south of the airport and is popular especially whilst Runway 33 is in use despite its many changes over recent years. Due to the construction of the runway extension, the car park has seen the loss of the popular picnic area (Area 4) and the old Car Park 5 (outlined in blue), however not to worry as new areas will be explained in more detail below. The car park has now transformed and is perfect for keen enthusiasts and family days out especially in the summer as it consists of new picnic benches and a brand new rain shelter and is situated raised up alongside the new 'Taxiway Sierra' with great photo opportunities especially of aircraft taxiing, arriving and departing on Runway 33. 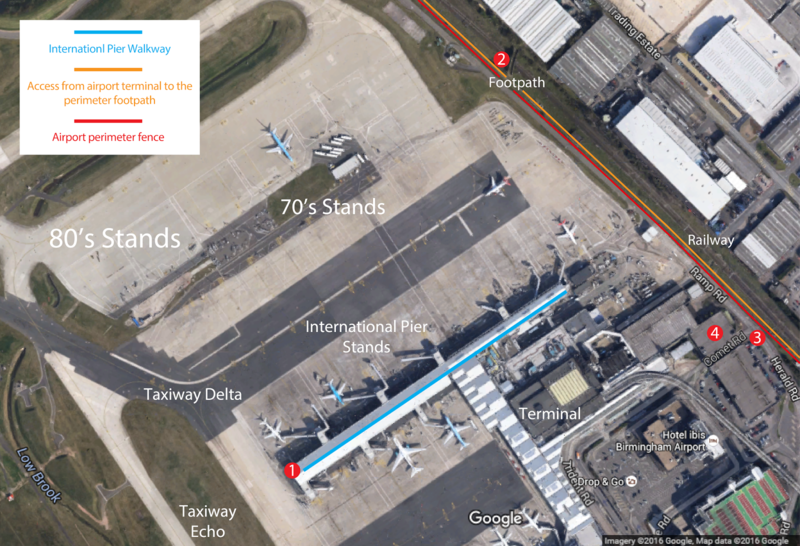 A thing to bear in mind is that Runway 15 arrivals will turn off before the extension area, Runway 15 departures will climb very quickly due to the extended runway and some Runway 33 departures will use Taxiway Echo and not take off full length. This can be a problem as the aviation fuel station will block part of Taxiway Echo so it is only possible to get photos of aircraft holding on taxiway Echo 1 before Runway 33 (Photo 1). Most large aircraft however will use Taxiway Sierra and for best results it is best to stay where the picnic benches are as the view consists of just one perimeter fence meaning easy shots of small-medium sized aircraft at an angle if you have a small enough lens, and a stepladder isn't required (Photo 2), however there are some road signs in certain places that may be visible in photos. A stepladder (see last paragraph*) will be required if you are anywhere between areas 5 and 6 as there is a double perimeter fence here, the second one being lower down the grass bank, and in order to get as much of the aircraft in your photo as possible, you need to be at a height. For Runway 33 arrivals you can get some excellent shots but again need to be at a height to capture the fast moving action (Photo 3). If the viewing area is quiet and you be quick about it, you can stand on the wooden benches to see over the fence, but this isn't recommended just in case you start to annoy people. It is best to spot here in the morning to early afternoon as the late afternoon comes the sun will affect your photos, especially in the winter. You are able to walk the full length of the perimeter fence. Near to the terminal the fence consists of wind breakers restricting views but if you are lucky enough there may be some gaps offering reasonable views of aircraft on the remote 20's stands. If you walk further up towards the old picnic/viewing area you will find there are no wind breakers and great views of Flybe/Ryanair aircraft arriving/departing from the terminal (Photo 1). However you can be patient and wait for other airlines to taxi towards Runway 33 and get great shots of them turning onto taxiway Echo (Photo 2). If you are lucky there are sometimes aircraft parked on Stand 25 as aircraft that are in need for attention by Monarch Engineering can be placed here temporarily. This stand is right next to the fence with no wind breakers offering great angle shots of any aircraft parked here (Photo 3). This location is best throughout the whole day until the evening as the sun will be behind you offering some good light. And finally an alternative is walking to the furthest point in the car park, right to where the perimeter fence lowers and a wood fence has been erected meaning you are able to see completely over the fence if you carefully stand on one of the wood fence panels, no step ladders needed. This area offers fantastic views of aircraft turning on Taxiway Sierra (Photos 1 & 2) and a clear views of aircraft approaching Runway 33 with no restrictions (Photo 3), therefore excellent photo opportunities. A disadvantage is again not all aircraft will use Taxiway Sierra and take off full length and although the perimeter fence is lowered, a metal wind barrier can appear in your photos, especially when photographing larger aircraft. This location is best in the early morning until early afternoon as the sun will start to move round and affect your photos of both aircraft departing and arriving. *When using step ladders please think security and ensure that they are removed after and in between taking photos as airport police strictly monitor the area. If you are not driving and are arriving from Birmingham International train station (Area 1) then this may involve a bit of walking but shouldn't take too long once you get to know the route. Get on the Air-Rail Link shuttle (Blue route) from the train station to the upstairs airport terminal (Area 2) then go downstairs. 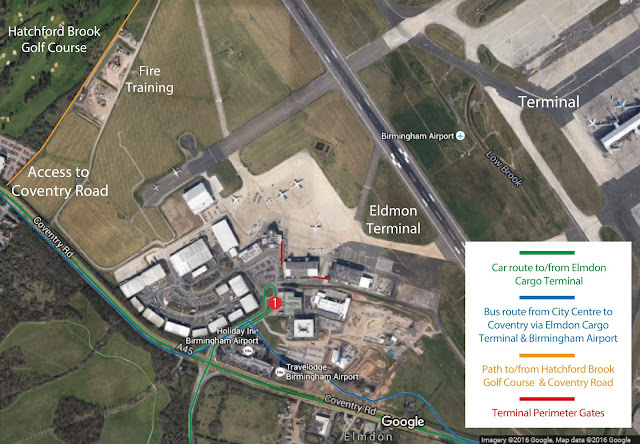 From here it is optional what you do, you can either walk through the downstairs terminal towards the Flybe check-in desks (Green route) or go straight outside and walk towards Area 3. Now follow the pavement (Orange route) towards the car hire and walk along the perimeter fence footpath into the car park. Marston Green is a village located towards the north of the airport and offers a wide range of popular spotting locations for the residents and visiting enthusiasts especially whilst Runway 15 is in use and in the summer months. The Train Station and local housing estates nearby means easy access to Sheldon Country Park and other areas within it which will be explained in detail below. This spotting location consists of a pedestrian bridge at Marston Green train station which is raised directly above the busy West Coast Main Line. From here you can see directly over the edge, no step ladders needed, and have a clear view of Runway 15, taxiway Alpha and Sheldon Country Park offering great opportunities of aircraft arriving and departing only when Runway 15 is use (Photos 1-2). When Runway 33 is in use photos are still possible but departures tend to climb very quickly (Photo 3) especially with the extended runway and arrivals will vacate onto earlier taxiways before the end of the runway which aren't visible so this isn't area isn't recommended. Please remember that this is a train station. Ticket office staff however will not be able to see you but try not to spend too much time here and not block the way as with frequent trains it may become busy at times. Also there are 2 pedestrian bridges at the station, to see the views you will need to use the one with the steps and not the zig-zag one with ramps. This location is best during the morning when light is good as in the afternoon the sun will move from behind the trees and affect your shots. Also try and avoid busy peak periods, especially if there are other enthusiasts in the same position as you as the bridge can become overcrowded and passengers may get annoyed if you are blocking the way. Sheldon Country Park is located at the end of Runway 15 and offers excellent side on/overhead shots of arriving aircraft and ground shots of departing aircraft when Runway 15 is in use. Here you have a clear view of planes on final approach (Photo 1) and planes waiting on Taxiway Alpha (Photo 2) but you may need to stand further back on one of the many uneven hills to see as much as possible due to the taxiway being slightly higher up than yourself. This means that you can’t stand directly by the perimeter fence as you won’t be able to see anything, even with stepladders so the further back you stand, the more you will be able to see. If you want side photos of planes arriving then you will have to stand of the path but move further back in order to frame the aircraft (Photo 3). This location is great for family days out in the summer months but unfortunately there aren't many benches so a picnic blanket would be ideal. If you are an enthusiast who wants to visit regularly, expect mud in the winter! When Runway 33 is in use most arrivals will again vacate onto earlier taxiways before the end of the runway and will also be difficult to capture departing aircraft rotating early and climbing out over the park, which is why I recommend option 3 below for keen enthusiasts who are on their own. This location is best in the late afternoon and evening as in the morning the sun will most likely be directly in your face unless taking side shots of arriving aircraft. Now we come to a remote spotting location on the border of Sheldon Country Park and Hatchford Brook Golf Course which consists of a small bridge over a stream which comes to a dead end with flat topped metal railings at the end. You are able to stand on these railings, no step ladders needed, but try not to stand on them for too long as if you lose your balance there is a bit of a drop. Not to worry though as these railings are right next to the perimeter fence of the airport therefore you can hold yourself up by holding onto one of the posts but be very careful as there is barbed wire which to date has been extended further. You are now able to see directly above the fence and witness aircraft lining up on Runway 15 about to depart (Photo 1) and arrivals from a great side angle (Photo 2). A small disadvantage however is the fact that there is a tall black cylinder in the way towards your right so it is best to get as many photos as you can before departing planes disappear behind it. This location is best from the afternoon onwards as the sun will then start to go behind you and offer great light for your photos. Any time before and the sun will be in your face. And finally if you fancy a bit of a walk then you can head further down the perimeter fence of the airport away from Sheldon Country Park alongside Hatchford Brook Golf Course. It is best to keep going until you find your desired spot which is likely to be near to the Monarch Hangar and Elmdon Site where the ground level is much higher in places than others. Here you are close to all of the action in line with the centre of the runway, but are faced with a double perimeter fence all of the way down making photos very difficult therefore step ladders (see last paragraph*) will be needed in order to see views of aircraft taxiing, touching down and rotating. When Runway 15 is in use you can photograph arrivals touching town and departures blasting down (Photos?). With a good camera lens you can get shots of aircraft taxing down Taxiway Alpha. When Runway 33 is in use you can photograph arrivals braking and turning off the runway and departures rotating (Photos?). Due to the runway extension planes will now tend to rotate earlier so Runway 15 operations are recommended. This location is best in the afternoon and evenings as the sun will be behind you offering great light for photos. Also this area may get muddy in the winter so the summer months are highly recommended. And remember nearby is a live golf course so be careful not to interfere with any games and try to stick to the perimeter of the course only. To get to Marston Green Train Station there are frequent trains to/from Birmingham to London via Birmingham International and Coventry. From here all you have to do is get off the train and go up the steps to the bridge to find the spotting location. If you drive however, enter postcode B37 7AF into your sat nav. Upon arrival use the station car park which is free of charge 24/7. Again if you have arrived by train, to get to Sheldon Country Park all you have to do is walk out of the back entrance of the station (Area 1) and follow the path directly into Sheldon Country Park (Blue route). 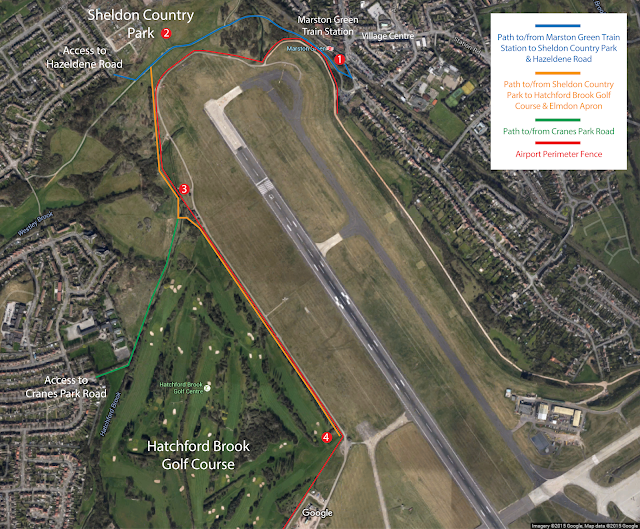 You can even access Hatchford Brook Golf Course if you walk further down, however this will take more time so alternate routes will be explained in detail below. To get to Hatchford Brook Golf Course, if you are driving and have a sat nav, enter postcode B26 3SS. This will take you to Cranes Park Road cul-de-sac. Once parked from here you can follow the access path on foot straight into the field and head towards the airport perimeter fence. You will now be at the touchdown area of Runway 15. As you continue to walk south towards along the double perimeter fence you will come to the end of the golf course near the Monarch Hangar and Elmdon Apron. This area will be explained in further detail below. The far south-west of Hatchford Brook Golf Course is a very distinct location on the top of an unused car park at the Elmdon hangar site. It can be hard to access if you are travelling by foot but at the same time shouldn't be forgotten about! 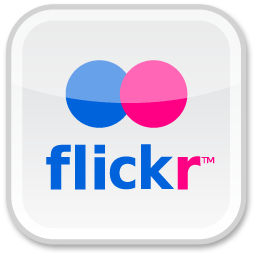 There are many benefits of spotting at this locations which will be explained more below. IMPORTANT: Top level of car park is now closed, even to pedestrians. You can still spot on the level below. Always display a valid parking ticket in windscreen. Failing to do so could result in a £100 fine. The Multi-Storey car park is located within the Elmdon Cargo Terminal towards the south-west of the airport and is popular for spotting when both Runways are in use due to the fact that being high up enables great shots of aircraft rotating, touching down and taxiing in various directions. Also from here you can view cargo aircraft parked on the Elmdon apron, maintenance aircraft parked in front of the new Monarch hangar and some of the airport terminal including tails of aircraft parked on the International Pier and aircraft parked on the 70's/80's stands (Photo 3). A good long range zoom lens (300mm plus) and good evening sunlight is recommended for all shots in order to get the best quality photos. Several hangar buildings and lamp posts do restrict some of the views during Runway 33 operations however if you are lucky you may be able to just catch some of the aircraft hovering over the runway. Not to worry though as the aircraft will appear behind the hangar after landing and apply reverse thrust (Photo 1), however aircraft will be moving quick and there's only a small window due shooting between 2 tall lamp posts (not ideal for large aircraft i.e A380, B777). Wind socks and the tails of cargo aircraft parked on the apron may also appear in your photo if you are too late. Overall this location is best for Runway 15 operations as most of the airfield is clearly visible and you will have a better angle and more time to shoot as the aircraft pan out. Here you can spot aircraft slowing down after landing before they disappear behind buildings and also aircraft blasting off down the runway and rotating (Photo 2), again before any of the tall lamp posts or hangar buildings come into view and appear in your shot. This location is best any time in the afternoon and evening once the sun has moved round as this enables great lighting for all long range shots, therefore not ideal during the morning when the sun is in your face. To access the Elmdon Multi-Storey (Area 1) by foot, this will be a challenge depending on your starting location. There are no train stations nearby however if you get off at Marston Green and are travelling from Sheldon Country Park, it is a long walk south through the golf course until you reach the A45 Coventry Road. From there you can follow the road round until you reach the road entrance to the Cargo Terminal. 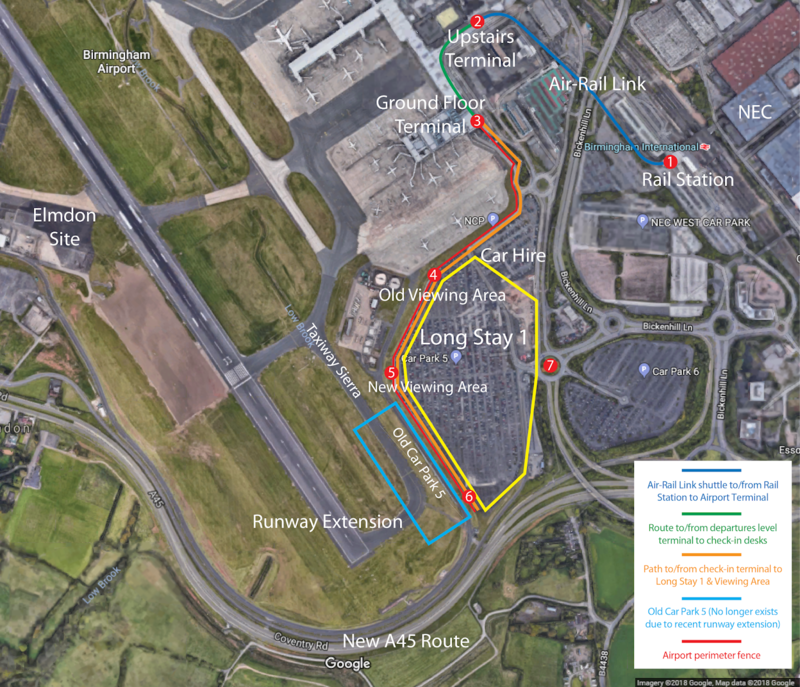 If you are travelling from Birmingham International train station, therefore the main Birmingham Airport terminal, there is little or no pedestrian access down the new A45 Coventry Road which was recently built due to the Runway 33 extension. If you are travelling by car this is an ideal way to get to the car park, however parking charges are likely to apply no matter what time of day. If you are travelling by bus, the number 900 operates frequently to and from Birmingham City Centre to Coventry via the Elmdon Cargo Terminal and Birmingham Airport terminal. There are various bus stops meaning very little travelling by foot is required. The Long Stay car park is a great way to get close up photos of aircraft parked on the stand or taxiing to and from the stands. Unfortunately the only way to spot here is to have a boarding pass, such as when going on holiday etc. due to the loss of the internal terminal Aviation Experience which is now closed. This area requires a boarding/staff pass in order to access. The International Pier is the newest part of the terminal as of 2009. 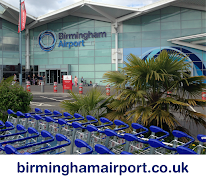 It is used for mainly long haul and international departures, where as domestic flights and Flybe/Ryanair aircraft are located towards the southern end of the old airport (Formerly Terminal 2). From the very end of the International Pier near Stand 54 (where the EK39/3K40 Emirates flight is parked - Now an Airbus A380 twice daily as opposed to Boeing 777). You can also get some decent photos of aircraft taxiing down Delta/Echo (Photo 1) through the glass. Some parts of the terminal are restricted due to pre boarding gates and waiting lounges however most of it will allow you to go up to the windows allowing great photos of aircraft being pushed back (Photo 2) as well as parked at the stands whilst boarding (Photo 3). Depending on your flight time this location is best until the late afternoon when the sun will be directly in your face as it will affect your photos. With a still camera and a stable lens decent night shots may also be possible. This location is not ideal for spotting as it is far away from the action of the taxiways as well as Runway 15/33, however it is there if needs be in order to get photos of parked aircraft on the 70's and 80's stands. It is accessible by walking a fair distance from the terminal building via a footpath along the side of the railway line and airport perimeter fence. The views here are restricted due to the high double fences however in some areas the ground starts to get higher, especially near the bridge that goes over the railway. If you have a good range zoom lens, you can get good side photos of aircraft lined up at the terminal gates, including tail shots (Photo 1) and photos of aircraft after being pushed back ready for departure (Photo 2) however as you can see they have to taxi away first so that the fence doesn't restrict your view. Not many aircraft use Taxiway Tango or Taxiway Uniform when arriving/departing so you would have to be very patient if you wanted to get a shot of aircraft using this route as it is only really used when aircraft are blocking Taxiway Victor. This location would only be ideal during the morning in good light as in the afternoon the sun will move round and be in front of you, possibly affecting your photos. To access the International Pier (Area 1) you either need a staff or boarding pass in order to access the gates and boarding areas. You then simply need to follow all signs for the gates and can have your camera at the ready and enjoy the views! Unfortunately if you are flying with Flybe/Ryanair you won't need to access the International Pier for boarding. If you want to give the perimeter footpath a try then you will need to access it by foot. This can either be from the airport terminal via Comet Road or Birmingham International train station via Station Link Road. You will need to end up at the intersection where Comet Road, Herald Road and Ramp Road all meet. Near here in front of a big billboard will be a small wooden gate which can be used to access the footpath (Area 3). Upon entering the gate, turn left and keep walking until you find your desired spot. If travelling by car you will have to park on the Short & Medium Stay 2 car park which is located on Ramp Road just before the airport security gate (Area 4).